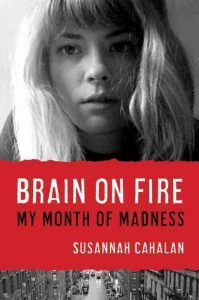 Brain on Fire: My Month of Madness is a medical memoir that may have caught your eye on library shelves—an attractive young woman on the cover, an author’s name spelled in a way that patrons (and maybe even staff) would search for incorrectly—it’s Susannah Cahalan, not Callahan. You’ll see buzz about it again soon, because a movie based on the book is in post-production—starring Chloe Grace Moretz. Brain on Fire is the compelling tale of a young professional who exhibits disturbing behavioral symptoms, which are easily misdiagnosed by medical professionals looking for horses instead of zebras. Their incorrect diagnoses lead to treatments that do more harm than good. Cahalan’s symptoms seem to suggest mental illness, which doctors are eager to label her with since she’s a young woman in a stressful profession. One doctor is sure she’s “partying too much.” But the truth is more complicated, because her brain and body are in battle with each other. She has a rare autoimmune disease, only recently discovered. It’s only because of Cahalan’s tenacity that she keeps searching for better treatment—and she knows that’s she’s lucky to have the skills to advocate for herself, and to be able to find a doctor current enough on research to be able to see the real problem. Not every person with the illness would be so fortunate. (This is where the reader gets scared, if they aren’t already frightened by the author’s symptoms which are reminiscent of Friedkin’s Exorcist.) Her family is a big part of her confidence, and her recovery, and she writes about them with compassion and honesty. Getting to the correct diagnosis is the first half of the journey—then the treatment and recovery are dramatic as well, and will keep you turning the pages. Brain on Fire is different from other examples of the popular genre of medical memoir because it’s not written by a medical professional (where, suddenly, their field is humanized for them) or by a complete layperson (where the author is at first lost in jargon but comes to an understanding about their disease). Our author, Susannah Cahalan, is an up-and-coming investigative reporter at the New York Post at the beginning of the book, and she uses her journalistic skills both to research her illness and to describe her journey through her illness. Her disease takes away her ability to work, and her career is very important to her. This book is her way of showing her chops in her field—she wants to prove she’s ready to get back in the game of newspaper work. Writing the book is an act of redemption for Cahalan—a way to illustrate that she has her identity and ability back. Cahalan also co-wrote the movie screenplay with director Gerard Barrett (who’s helmed gritty Irish dramas Pilgrim Hill and Glassland). The author’s perspective on her illness and her life make this medical memoir cross over into a coming-of-age story—a young woman fighting to establish her place in the world, and in her own life, and even in her own body and mind. I’d recommend Brain on Fire to medical memoir fans, and the New Adult/Mature YA reader. It is a surprisingly quick and attention-grabbing read for a heavy topic, so it’s a good plane read as well. You might think that since Cahalan was a reporter for the New York Post that the book would have a “Man Bites Dog” tone to the narrative—I was hesitant about the book for that reason at first, but I was pleasantly surprised by her enjoyable style. The tone is approachable and authentic, like an especially engrossing magazine article; but it’s still written with the authority of a piece that’s been thoroughly fact-checked. No one’s going to come back and tell you it was boring. Cahalan, Susannah. Brain on Fire: My Month of Madness. New York: Free Press, 2012. Print.